I remember a 1990-ish visit to a Japanese submarine base and being dumbfounded to see the subs flying the rising sun flag off their stern masts. Dumbfounded, because being, ahem, of a certain age, I associated the flag — a red disc with red and white “beams” extending outward — with the aggressive World War II-era regime that launched a surprise attack on Pearl Harbor in an effort to exercise total dominance over the Pacific. Its use was banned in 1945 following the surrender to the United States and its allies, but many Americans don’t realize that it was re-adopted in 1954 as the war flag and naval ensign of the Japan Ground and Japan Maritime Self-Defense Force, respectively. This isn’t news to U.S. sailors stationed in Japan, now a staunch U.S. ally, or those who’ve trained with the Japanese navy — such as the Norfolk-based sailors assigned to Destroyer Squadron 26, taking part in a “PASSEX” with the Japan Maritime Self-Defense Force Training Squadron — manned by newly commissioned Japanese surface warfare officers — through today off the U.S. East Coast. 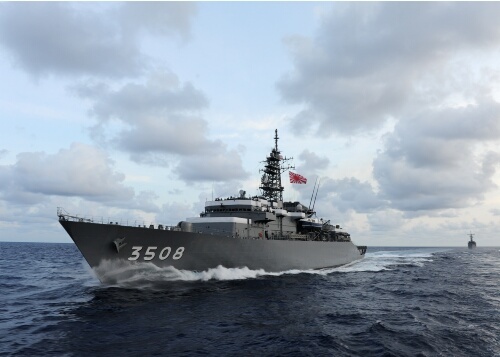 The Japan Maritime Self Defense Force training ship KASHIMA passes the destroyer Nitze during a passing exercise. // U.S. Navy photo by Mass Communication Specialist 2nd Class Marie Brindovas, PASSEX Public Affairs. PASSEX is an exercise that tests routine operational challenges and is meant, according to the Navy, to strengthen the partnership between the U.S. and Japan. 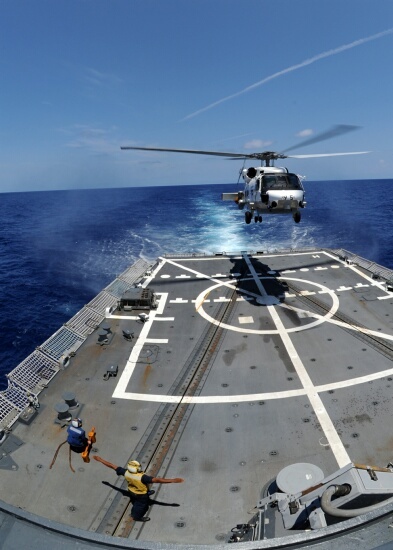 Tasks include operating a Japanese helo on a U.S. ship. Sailors assigned to the destroyer Nitze guide a Japanese SH-60 helicopter onto the flight deck. // U.S. Navy photo by Mass Communication Specialist 2nd Class Marie Brindovas, PASSEX Public Affairs. Today, incidently, is a big date in post-World War II affairs. The final meeting of the “Big Three” nations — the U.S., the Soviet Union and Great Britain — concluded on a sour note. The failure to resolve expected post-war issues at the Potsdam Conference, historians say, helped set the stage for the Cold War. Now, why can’t the US Navy get a Ship similar to that to Train Midshipmen and use that as a training vessel for the Naval Academy. On the Plus side the US Navy can get a Light frigate and possibly the US Coast Guard can get an OPC out of it as well.